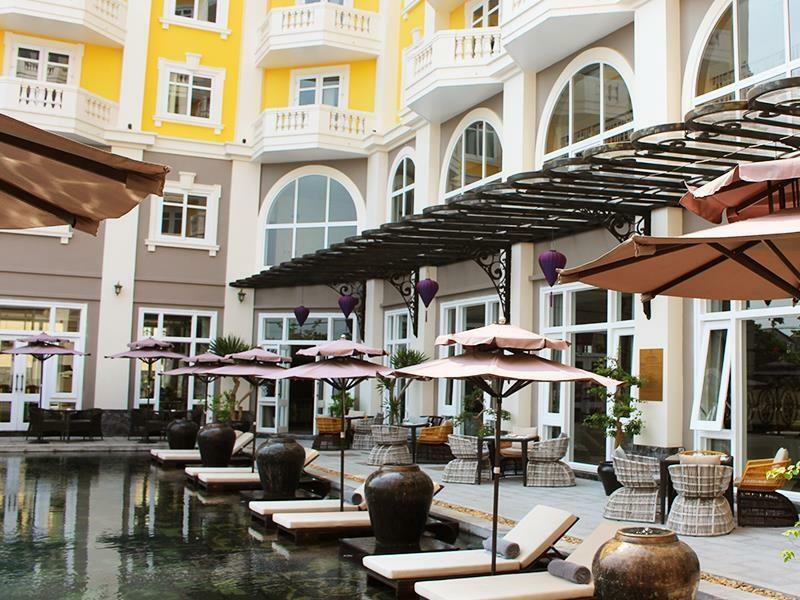 Rattan is an attractive, lightweight, and durable material for furniture. It’s also eco-friendly, as the plants are fast-growing and plentiful. 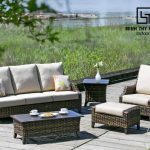 Whether you choose to display your rattan indoors or out, following these steps will keep your rattan clean and in good repair. The approach of Summer and the terrible weather we seem to be having this Spring, surely means we are in for a cracking summer?!?! 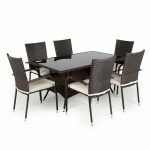 We can only hope that many weeks of al fresco dining lie ahead of us and this brings up the problem of having to get your garden furniture out of storage or from under its winter covers. And if it is looking a little less than happy, then never fear, Minh Thy is on hand. 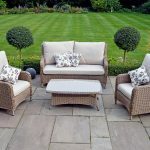 You don’t need to worry about buying new furniture (although we would recommend Minh Thy if you do need to purchase new), with a little effort you can have that garden furniture looking as good as new. Use a soft brush to loosen any dust, dirt and debris such as leaves .Don’t use any brushes with abrasive bristles. Dusting your rattan garden furniture on a weekly basis is highly recommended. Clean the furniture using a vacuum cleaner after brushing. If your rattan furniture has been painted, be sure to go easy with any vacuum brushes or other cleaning utensils, as you don’t want to scrape off the varnish. To make sure you get it all, a toothbrush or pair of tweezers can be used to remove any remaining dirt from harder-to-reach places. Clean inside all of the crevices, and in between the weaves. Adding a little water with some soap suds to the tip of the toothbrush may make this task easier to handle. Take care not to damage the rattan, or leave the pattern of weave out of position if you move it. At least once a month you should then also wipe down your furniture with a soft cloth and warm soapy water in a bucket. While this can be done indoors or outdoors, you will probably have more space to safely manoeuvre and clean the furniture outside. If you are cleaning natural rattan, be very sparing with the amount of water you use. 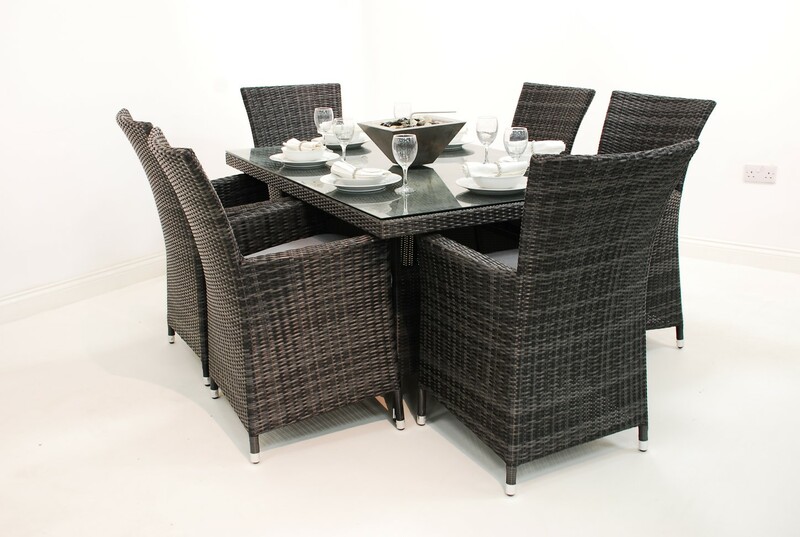 Furniture made from paper rattan should never be cleaned with water – use a damp cloth instead. Synthetic rattan garden furniture, on the other hand, isn’t damaged by water. It can be cleaned by gently spraying the furniture with water from a garden hose pipe or jet washer, and applying some light detergent. Mild, washing up liquid will do the job just fine. Before cleaning your garden cushions, always check first with washing recommendations by the retailer or manufacturer. The cushion cases that come with the rattan garden furniture sold by White Stores, for example, are machine washable at 40°C, but can also be washed by hand or fabric cleaner. Once cleaned, completely dry your rattan furniture with a fan or hairdryer – or, if the weather is hot enough, leave it outside in the sun to dry off. A windy day will help your garden furniture dry faster. Do not leave your furniture wet for too long as mould or mildew could develop. These little black spots can be removed from natural rattan by using a watered down solution of bleach and some gentle scrubbing with a soft bristle brush. 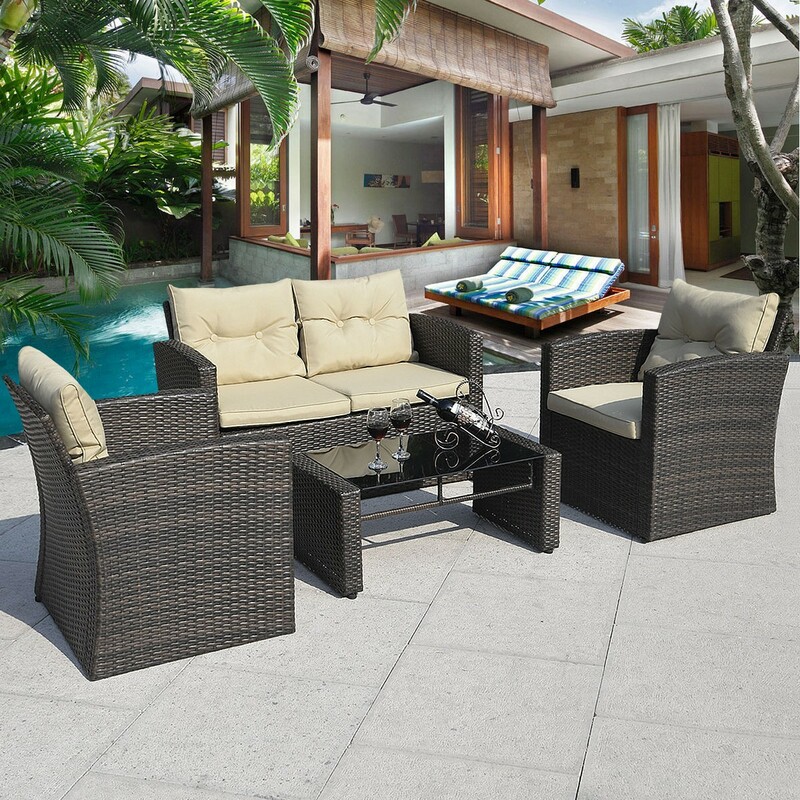 In the 10 years of operating our company, White Stores have yet to see any mould or mildew growing on the synthetic rattan garden furniture we sell, but if some ever does appear on your own chairs or tables, simply brush or jet wash it away. 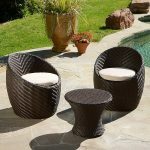 Once you have thoroughly cleaned your rattan garden furniture, there are many ways to further revive the rattan’s good looks and protect your outdoor furniture against the elements. After all, you don’t want your garden furniture to look old and faded when your friends, family and neighbours pop round for a barbecue this summer. 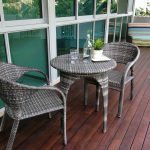 The highly appealing low maintenance attributes of synthetic rattan mean that, apart from regular cleaning, you won’t really have to do much more to care for it. So, open up your bottle of beer or soda, and skip straight down to our very last couple of tips below. 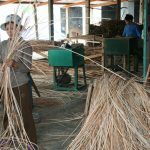 However, furniture made out of natural rattan requires a little more care and attention from the owner who wants to prolong its working life. Cracked, split or dry natural rattan furniture that’s unpainted can be restored by applying boiled linseed oil with a brush. It has to have been boiled because raw, unboiled linseed oil will not dry or harden. Once the furniture can’t absorb any more of the oil that’s being applied, wipe it clean with a soft cloth. 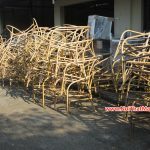 Allow the rattan to dry and harden before using the furniture again. If your natural rattan furniture is located in the conservatory or elsewhere indoors, you may also need to install a humidifier to add moisture to the air and prevent the natural rattan strands from drying, cracking and splitting. 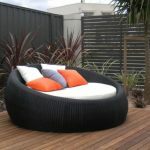 You can also try thinly applying a UV coating to help protect natural rattan against sunny weather. A DIY hardware store or large supermarket will have what you need. 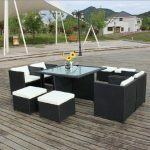 Some outdoor furniture waxes also come with UV protection. 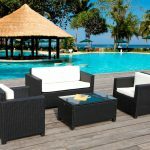 Synthetic rattan is already protected against UV damage and won’t require any additional coatings of lacquer, varnish or wax. Scatter cushions, blinds or awnings can help shade the natural rattan material and stop it from cracking or splitting when exposed to direct sunlight for extended lengths of time. Thinking of appearing on the Antiques Roadshow with your retro natural rattan furniture? Then don’t ever paint it. Painting any antique piece of wicker furniture will greatly reduce its market value. If your rattan garden furniture hasn’t already been sold with them, place rubber stoppers under the legs of your rattan chairs, tables, daybeds or sun loungers. This will prevent the bottom of the legs from scuffing and being marked, especially if your guests are moving the furniture around the hard surface of a patio. When not in use, remember to protect your rattan garden furniture with a properly fitting cover that is fully waterproof and can handle the sun’s ultraviolet (UV) rays. Alternatively, especially during the coldest winter months, store your garden furniture safely away in a shed or garage that’s dry and warm.